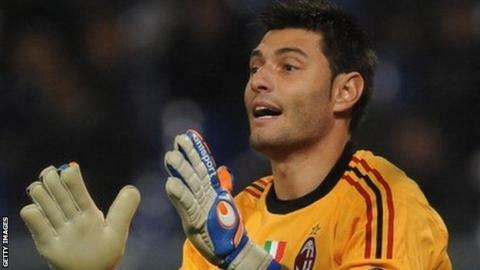 Chelsea have completed the free transfer of former AC Milan and Italy goalkeeper Marco Amelia on a deal until the end of the season. Amelia, 33, has been signed after Thibaut Courtois damaged medial knee ligaments in September and is likely to be out until December. Capped nine times by his country, he is available for the Blues' next game at home to Aston Villa on 17 October. He was part of the Italy squad that won the 2006 World Cup. Amelia has spent his career playing in Italy and his former clubs also include Livorno, Palermo, Genoa and Perugia. Asmir Begovic, signed from Stoke City for a reported £8m in July, has played in Chelsea's last seven league and cup games. The Premier League champions are 16th in the table after losing four of their opening eight matches.